Clean Up Booster is an optimizing tool which quickly & easily cleans up WordPress & boosts up the loading time of your website. It is the most powerful plugin that removes all kinds of unusable data such as old revisions, spam, and many more. Why you need Clean Up Booster ? Over the time your site starts to pile up the unnecessary data which leaves your database bloated and makes it sluggish. Clean Up Booster is a lightweight high-performance plugin which will get rid of all the irrelevant data with just a couple of clicks and make your WordPress clean & empty. WordPress database stores everything which you need or don't. 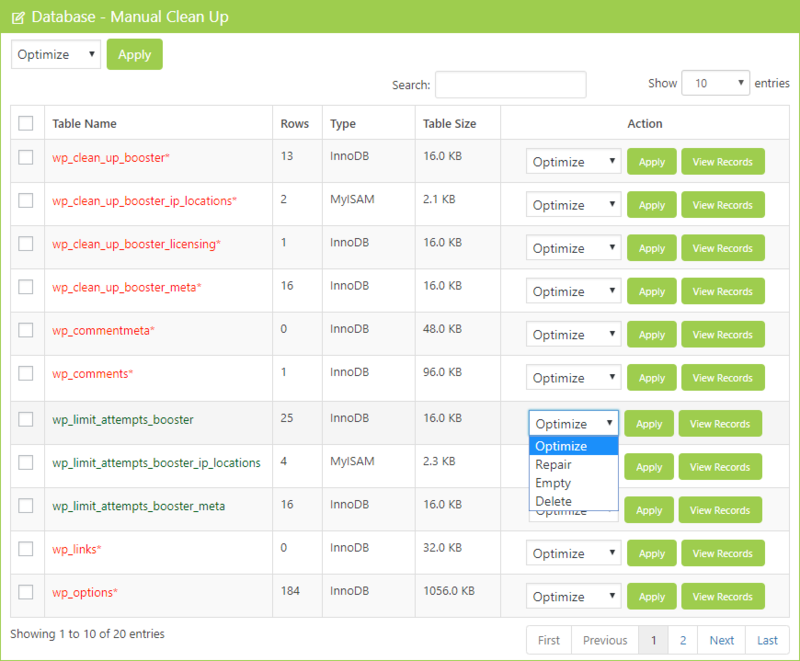 Clean Up Booster clears out all unnecessary data from your database and makes it lean & thoroughly optimized. 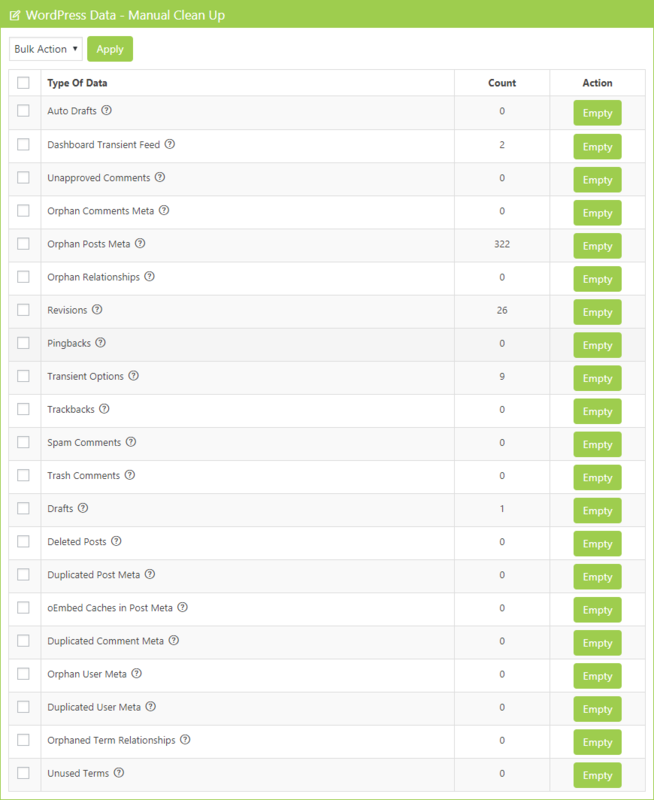 WordPress data can be cleaned with phpMyAdmin, but it appears things to be risky. Clean Up Booster plugin helps to clean and optimize the database without login to phpMyAdmin. Simply go through the series of steps to deep clean and optimize your website. Clean Up Booster is an ultimate WordPress plugin which allows you to clean WordPress and optimize database along with performing other vast security functions. It's one of the most reliable, easy, and highly efficient WordPress optimization plugin which stands out from the crowd. Don't make your site sluggish and bloated with unnecessary data such as revisions, auto drafts, unapproved comments, dashboard transient feed, orphan relationships, etc. With this feature, you can manually remove the unnecessary data from the WordPress database which makes it clean & empty. 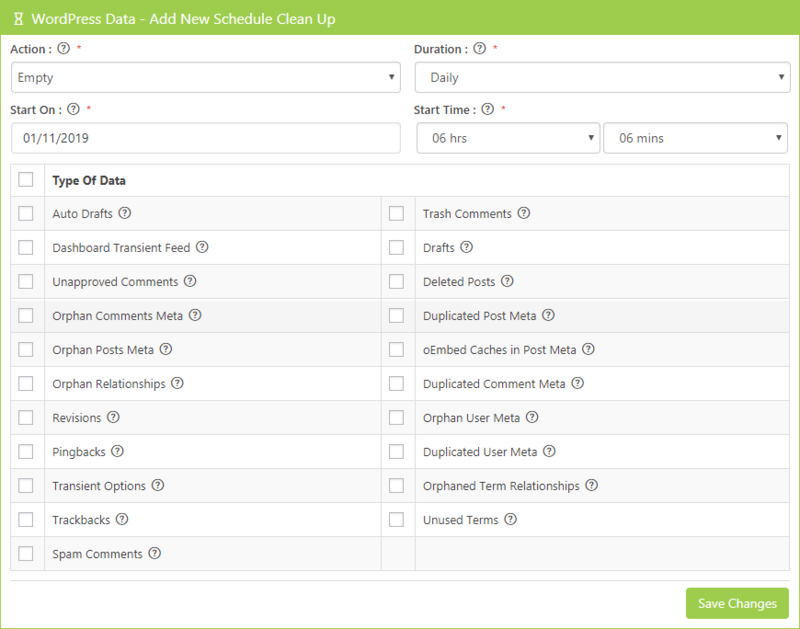 Using scheduler configuration settings you can schedule the cleanup process to automatically remove data from WordPress. Without any hassle configure the scheduler settings on a daily or hourly basis. Without phpMyAdmin access, you can preview the data which is present in your database in just one click. You can also view the size of the table and the number of rows available in each table. 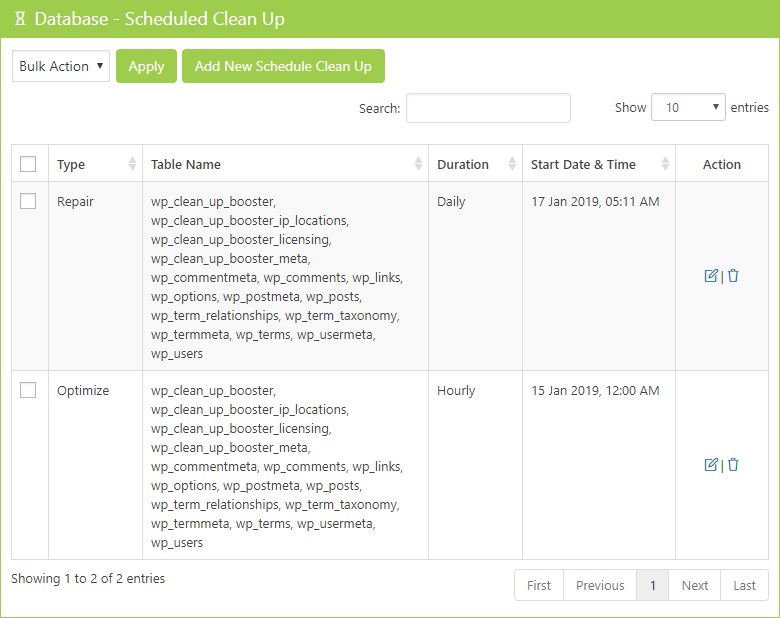 With this feature, you can schedule the process of optimizing, deleting and repairing database tables so that you can get rid of the unnecessary data and also optimize your database. It repairs the possibly corrupted tables, reorganizes the storage of data, delete or drop complete tables to improve the efficiency of your database. Clean Up Booster allows you to manage and monitor the detail information about the scheduled events. It displays the time duration with start date & time of the scheduler. Scheduling is actually a set-it-and-forget-it mode. You can also perform edit and delete action on the scheduled events. 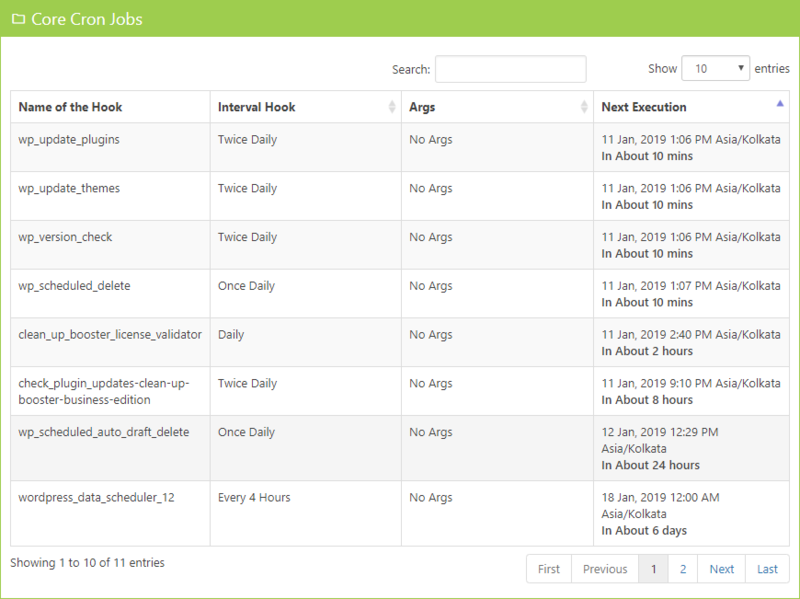 Cron Jobs are the scheduled tasks that automatically run at a specified date and time. Clean Up Booster displays the detail information about the Scheduled Events, along with the Arguments to pass to the hook function(s) for WP scheduled events. It also displays date & time for next event execution. You can also perform delete action on Custom Jobs. Clean Up Booster provides you a valuable solution for maintaining Login Logs in which you can keep a record of the users who logged in to your site and also helps to displays their Geolocation on the map. 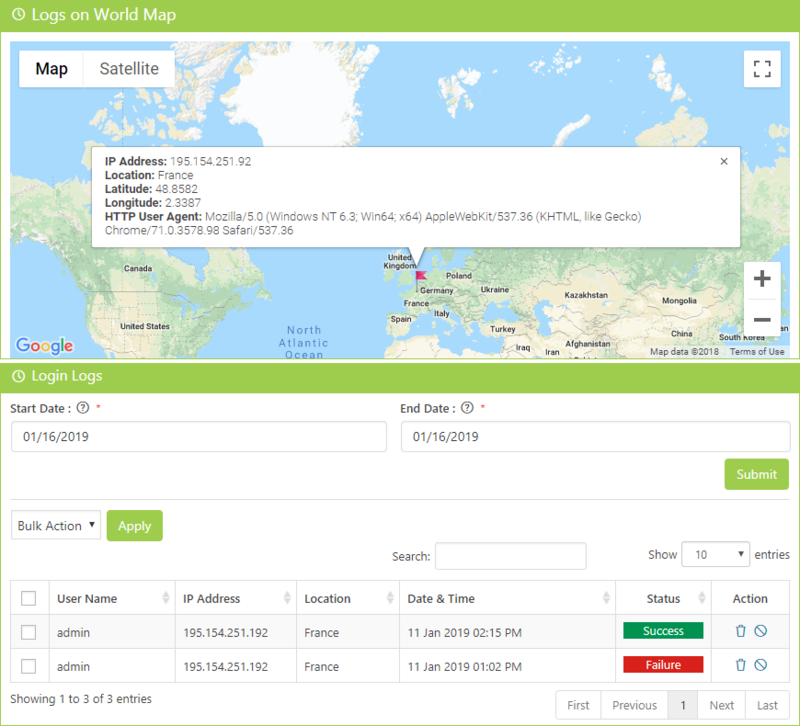 The map view displays an info window that gives information about the users such as IP Address, Location, Longitude, Latitude, and its HTTP User Agent. 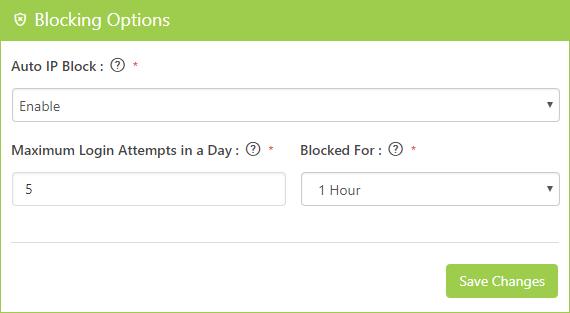 Clean Up Booster sets up a limit on the number of unsuccessful login attempts and allows you to block the account of those users who exceeds the specified maximum number of login attempts for a particular specified time. When different events occur different error messages displays on your site. 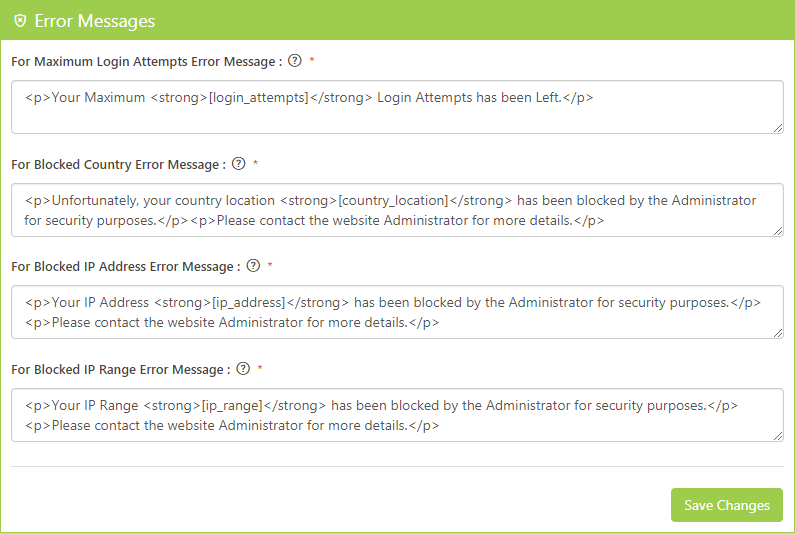 Clean Up Booster allows you to independently customize the error messages according to your requirement. 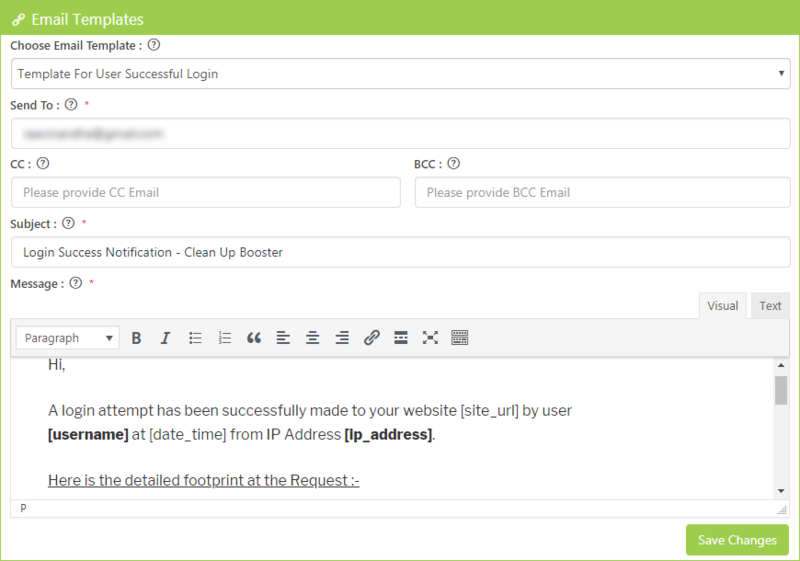 Clean Up Booster provides different in-built email templates that are sent to the email address configured during the various events on the website. You can customize the body of the Email Templates according to your requirement and also provide more than one email address by using CC or BCC field. What you can Remove Automatically? Clean Up Booster Pro Edition offers you Full Features, Support & Updates for Unlimited Sites. Clean Up Booster Developer Edition offers you Full Features, Support & Updates for Unlimited Sites with Contact Bank, Backup Bank, Gallery Bank, Coming Soon Booster & Captcha Bank Pro Edition. Whereas Agency Edition offers Full Features with Support & Updates for Unlimited Sites with Contact Bank, Gallery Bank, Coming Soon Booster, Facebook Like Box, Google Maps Bank, WP Mail Bank, Captcha Booster & Limit Attempts Booster Pro Edition.